Use these resources to begin your exploration of math and science as a support for early literacy development. Give your family a daily dose of math with stories and problems at different levels of difficulty. Education begins at home, and so can your child's development of foundational math and science skills. 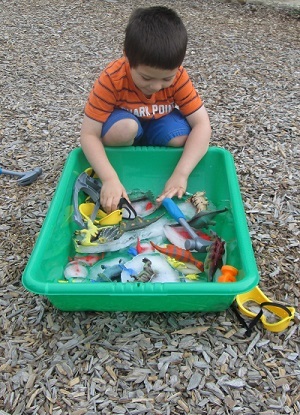 Check out these resources to support your math and science explorations! Find a multitude of science activities that your family can do at home, in the neighborhood, or anywhere! Wondering and asking questions is encouraged when you visit this family literacy website. Check out the "Wonder of the Day" or search for resources to help you answer a question posed by your child. You don't need a fancy lab to help your child build math and science skills. Here are some tools you already have at home! It's not your typical bedtime story, but nonfiction text has a critical role in your child's development of pre-reading skills. Learn more about how to use nonfiction texts with your child. Counting and classification games for preschoolers as well as more challenging math games for older children. This guide was created to help you find resources that support math and science in early childhood. Use the tabs to discover just a few of the great children's books available at your local library as well as relevant videos and links to other online resources. National Science Teachers Association annual list of trade books for grades K-12. This free online course from the Lee Pesky Learning Center offers ideas to support foundational math skills development. What, Teaching STEM in Preschool, Really? Audio interview: Rae Pica with Dr. Sherri Killins, Lilian G. Katz, Ph.D.,Deborah J. Stewart, M.Ed. This presentation from the NAEYC 2014 Annual Conference & Expo in Dallas, Texas, discusses the value of incorporating language – both teacher and student – in early mathematics learning experiences. What does STEM look like in preschool and what is STEM anyway? Find the most recent updates on Little Read Wagon workshops and activities.